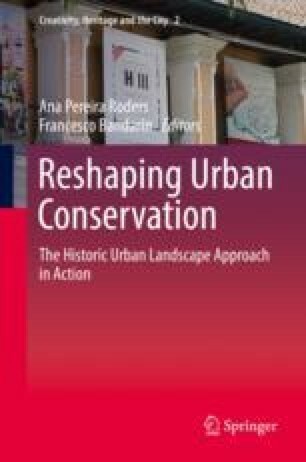 Eight years after the adoption of the Recommendation on the Historic Urban Landscape (HUL approach) by UNESCO member states, governments worldwide no longer doubt their sustainable development is dependent on heritage, cultural and natural, and are united to strengthen the efforts to protect and safeguard this heritage. What are governments doing? What resources are they listing as heritage? Who is involved? How? What are the results? These are questions that are fuelling the curiosity of many, in science and society, but only a few, leading innovative practices in heritage planning, including those exploring the implementation of the HUL approach, have started to answer them. This chapter discusses the state of the art, based on a literature review, contextualizing the experiences and key lessons of these leaders so far, active in the global diffusion of heritage planning innovation. Results revealed that even though there has been great progress in exploring the broadness in scope, which is still expected to escalate in the upcoming years, there is a strong difference between goals and actions when it comes to the implementation of the HUL approach. Caterina, G. (2016). Innovative strategies for the recovering of historical cities, TECHNE, No. 12, pp. 33–35, Available at: https://doi.org/10.13128/Techne-19330 Accessed 12 Jan 2018. UN. (2016). Global sustainable development report: 2016 edition. New York. https://sustainabledevelopment.un.org/globalsdreport/2016. Cited in 12 June 2018. UN. (2017). The new urban agenda. United Nations, New York (Available via HABITAT3, 2017). http://habitat3.org/wp-content/uploads/NUA-English.pdf. Cited in 12 June 2018. UNESCO. (2005a). Technical cooperation for the enhancement, development and protection of the Town of Luang Prabang, Lao People’s Democratic Republic, Paris: UNESCO (Available via UNESCO, 2018). https://whc.unesco.org/en/activities/29. Cited in 2 August 2018.